Bradley smokers take smoking foods to a whole new level with their specialized technology. This alternative smoking method offers more versatility and control, resulting in precise cooking and consistent smoke flavor. The Bradley Original Smoker takes the guesswork out of smoking with its accurate temperature control and automatic fuel feed that keeps this unit smoking for up to eight hours. 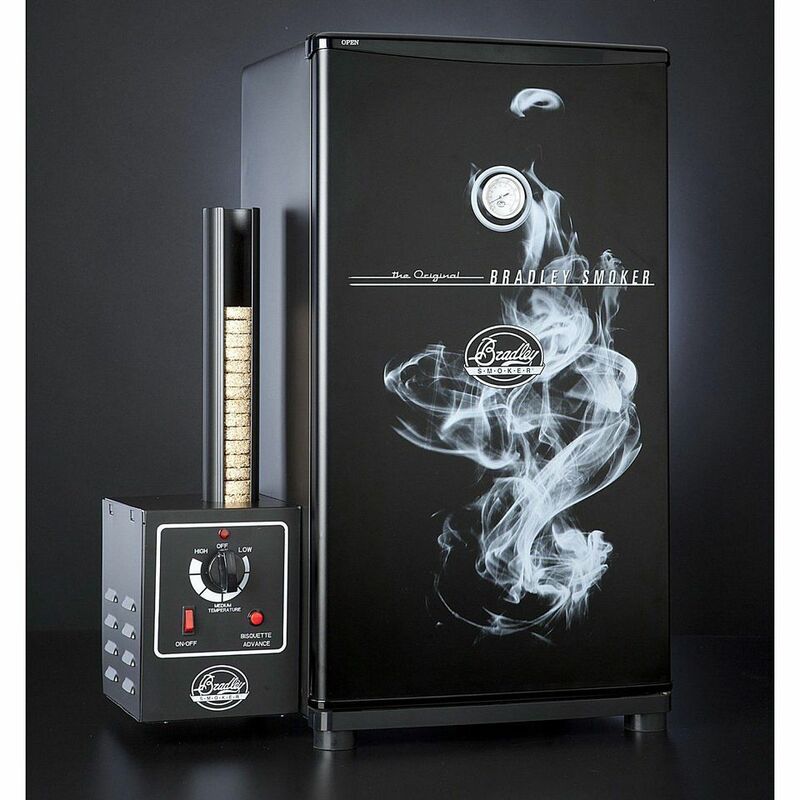 This refrigerator-style smoker is thermostatically controlled and can both hot- and cold-smoke—you truly get a wide range of smoking abilities out of this unit. Smoke is created by burning wood disks that are added to the unit by a controlled mechanism. You get as much or as little smoke as you want and you don't have to tend to any fire. In fact, once it is set you can leave it until you are ready to eat. The Bradley Original Smoker is a refrigerator-shaped smoking appliance. It is electrically powered, thermostatically controlled, and uses hardwood "bisquettes" (made by Bradley in a variety of flavors) to produce smoke. Fill this unit up with whatever you want to smoke, load the bisquette dispenser, and turn it on. Eight hours later you'll have your barbecue, or smoked fish, or even dessert—practically anything you want to give a smokey-flavor can go into this smoker. The stainless steel interior provides insulation for maintaining the smoker's temperature, even on very hot or very cold days. With over 2,200 cubic inches of space, you will have plenty of room to smoke food for a crowd. And, with the automatic bisquette feeder system and automatic smoke generator, you can enjoy the party while the Bradley Original Smoker does its thing. In addition to making barbecue, you can use your Bradley Smoker to cold smoke fish, like smoked salmon. You can also use it as a food dehydrator to make great jerky or dried fruit. You'll need to clean it out well, especially after the fish, but the stainless steel interior makes that pretty easy. While this might not sound like authentic barbecue, this unit is designed to get you about as close as you can without having to tend a fire and set vents. This is the perfect appliance for someone who just doesn't have the time, patience, or space to do it the old-fashioned way. The payoff is that you now have a completely self-contained unit and a highly versatile cooking appliance that smokes (hot and cold), roasts, and dehydrates food. If you are looking at this type of smoker, you are probably familiar with its refrigerator size and shape. The Bradley Original Smoker is 31 inches tall and 24 inches wide with the generator, a substantial piece of equipment that not everyone has room for on their patio. And, because of Bradley's unique structure, you need to use Bradley flavor bisquettes as the fuel (sold by Bradley as well as other online retailers).